Do Tanning Salons Comply with Regulations About Youth Access? Forty-two states plus the District of Columbia have laws limiting use of tanning salons by minors. However, even with these regulations in place, nearly 2 million high school students report indoor tanning. Using a phone survey, a recent study sought to determine how often salons in 42 states and the District of Columbia complied with their current indoor tanning legislations. Researchers called 10 salons in each of the states where legislation exists to protect minors from tanning bed use. The callers followed a script where they posed as a minor who was under the age of consent, and asked whether they could come in to tan and whether they would need a parent or parental permission in order to do so. The results of the survey showed that 37% of the salons were noncompliant with their state’s legislation. 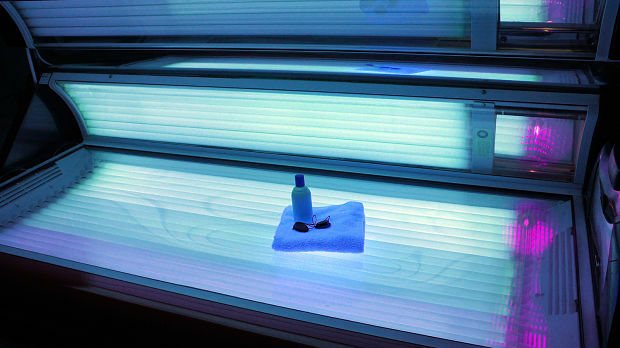 The most common violation was allowing an underage customer to tan as long as they had parental consent, even if this was not the law in the state. The authors note that when reviewing laws in each state, they noticed that most laws were silent on monitoring and enforcement; if enforcement was mentioned, it was usually handed over to local health departments which report infrequent inspections of tanning salons. Penalties for violations were light, mostly small fines that may not be enough to deter violations. The authors found that states that had multiple regulations, had worse compliance than states with a single law. They suggest that it may be easier to enforce when the legislation is a clear ban on services for minors – the three states that had 100% compliance had such a ban. The authors note that this study is based on a telephone interaction and that the results may have been different if the methods had included in-person visits. The authors conclude that despite the importance of legislation restricting youth access to indoor tanning, current tanning salon compliance with legislation is a problem, especially in rural locations, the southern United States, and independently owned tanning salons. The most effective legislation seems to be tanning bans for all minors. They state that this study highlights the need for more education and better law enforcement regarding state legislation and the harmful effects of UV indoor tanning.